(FIX) What’s happening to the bees? Honey bees (and all other bees too, for that matter) are struggling. Recent winters have seen catastrophic cases of Colony Collapse Disorder (CCD), where entire hives die over winter. Before 2006, the annual expected loss for bees was around 10-15 percent. Since 2006 that number has more than doubled to over 30 percent. CCD is recognized as an international issue, and some predict it will soon directly increase food costs. CCD is more poetically known as "Marie Celeste disorder": the bees just vanish and no one knows exactly why, although we can hazard a few educated guesses. The problem is likely to have been caused by a combination of several things: an increase in mites and diseases, the use of some agricultural chemicals, and a weakened bee population caused by reduced availability of the right types of foods. Up to one third of our food is pollinated by bees, adding some $15 billion in value to crops every year. If only for selfish reasons, we need to halt this decline. Bees are the principal pollinators of many of our fruits and vegetables, and with these huge losses, vast swathes of our diet become more and more expensive. But what can mere gardeners do about such a huge problem? Plenty, in fact, as gardens are wonderful resources for bees, often managed in a gentler way than surrounding countryside and with a greater diversity of inhabitants and habitats. By planting the right vegetables and flowers, you can create an attractive environment for bees right in your back yard. One helpful move is to garden organically. While there are questions over the specific ways pesticides may affect bees, you should give up on using chemicals in your garden. By doing so, our gardens can become safe havens for the troubled bee population. Perhaps our most important role, however, is providing the right kinds of food, which comes in the form of pollen, held deep within flowers. Happily, we happen to like the same things as bees, albeit for entirely different reasons. Bees have a mutually beneficial existence with angiosperms (flowering plants). But not every flower is created equal in the eyes of a bee. Bees are attracted to flowers based on color, scent and appearance. Modern plant breeding has made life a little harder for bees than it once was. Breeders have taken a fancy to double flowers, thick with multiple petals. These flowers hide nectar deep down inside beautiful ruffles of pink, purple or orange. If the flowers even have any nectar left after so much breeding for fine looks, bees just can’t find it. 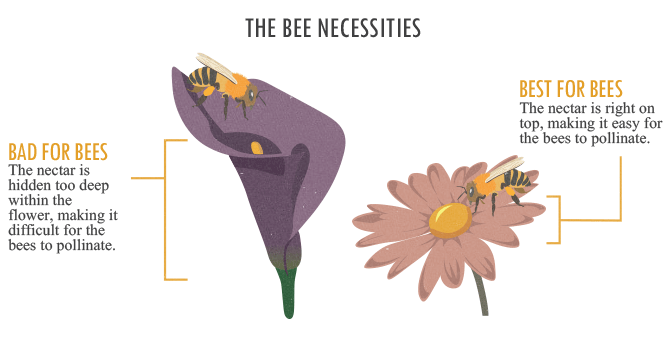 Try planting simple, old-fashioned, single flowers that are brimful of nectar. Herbs such as lavender, catmint, sage, thyme, fennel, and chives are among the best. An herb bed will be buzzing with bees on a sunny day. Along with choosing simpler flowers, choose a spread of flowers across the year. Queen bees emerge from hibernation in spring and need an instant hit of nectar to break their fast. They will throw themselves gratefully at cranesbill and chives, sucking up the nectar as if they have just made it across the Sahara. Plant these early risers next to early blossoming nectarines, peaches, and apricots and you are guaranteed pollinating visitors and plenty of fruit later in the year. 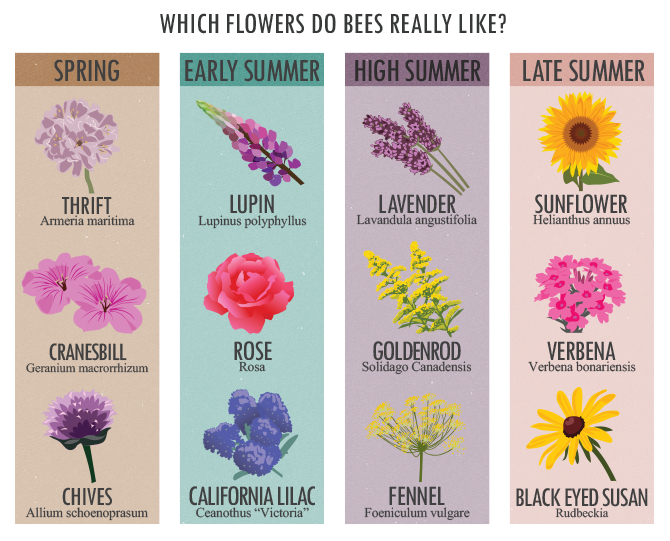 Here is a chart of good flowers to plant over the growing season. Apply this same idea throughout the season, making sure there are always simple-flowered pit stops available for bees. You might go for thrift in spring, roses in early summer, lavender at high summer, and sunflowers in late summer. Plant these pollen-rich flowers in groups, close together and in full sun, providing the most welcoming place for bees. With these steps, your garden will be filled with life and color, and you will be doing your part to bring back the bees in the process.